I’m so excited to share this project with y’all! 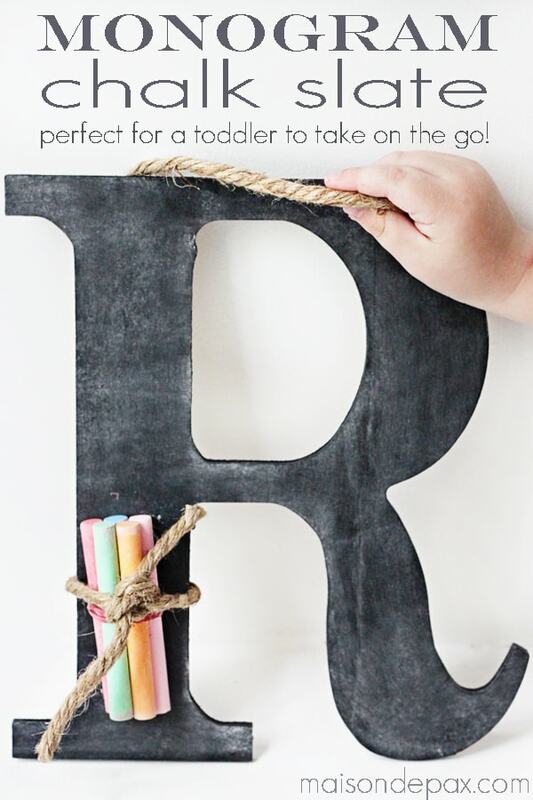 These chalkboard letters make an adorable gift or party favor, and they are wonderful for moms and little ones. Hang them somewhere for easy art or keep them in your kid’s bag to pull out when a little sit-still entertainment is needed. These little chalkboards are so fun and convenient! If you’ve been following for a while, you know that I consider myself fairly handy, creative, even inventive at times…. but not very craft-y. So when one of my random, hair-brained, craft-y ideas actually turns out, I’m pumped! I made these as party favors for my sons’ birthday party recently, and they were a huge hit. My two boys (who just turned 2 and 4) love them, and I am definitely planning to take them next time we go to the doctor or anywhere else with a waiting room! They’re even the perfect size for little ones to carry themselves. And, better yet, they were so easy and inexpensive to make! 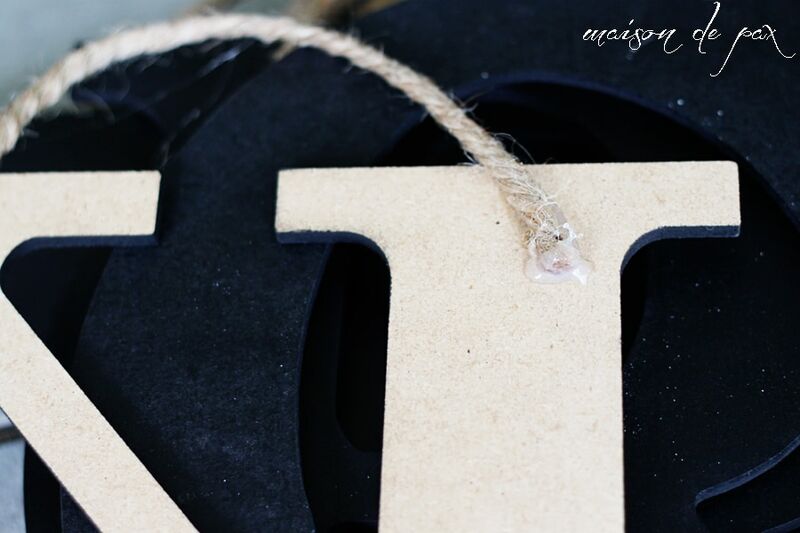 I started with simple mdf letters from Hobby Lobby (catch a sale – they were less than $1.50 each!) and a can of chalkboard spray paint. 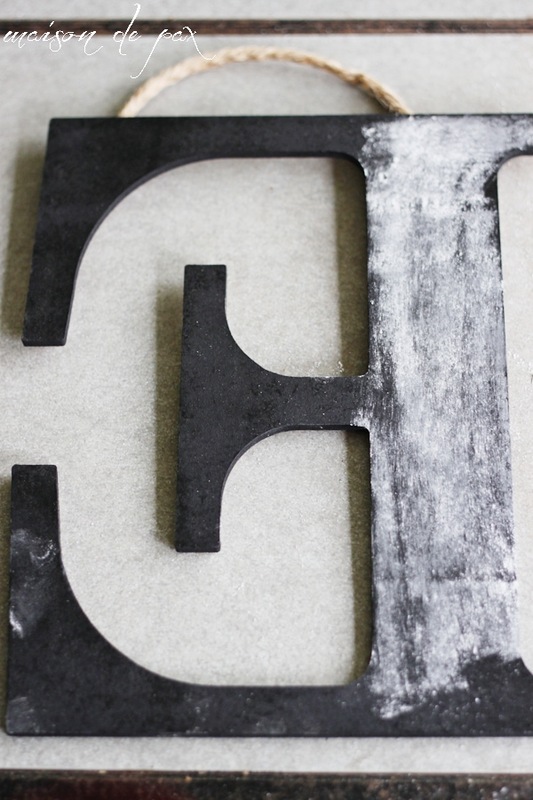 After two light coats, I sanded each letter by hand with 320 grit sandpaper. I think the key to making homemade chalkboards work is getting them perfectly smooth… and a quick rub down with the 320 was perfect. I finished off with one more light coat (that makes 3 total). Once painted, I added a jute handle (either for hanging as decor or for carrying) using hot glue. I made sure to cover the end of the twine in glue, as well, to avoid unraveling. Which is just a fancy way of saying rub chalk all over it (if you skip this step, the first thing you draw on the chalkboard usually won’t ever come off completely). Then wipe it off, leaving a nice chalkboard finish. Don’t forget to glue at least one of the handles on upside down… Just kidding! But seriously, of course I managed to do that to the birthday boy’s letter. Oh well, the beauty of hot glue is that I was able to pry it off without too much work or damage and put it on right. 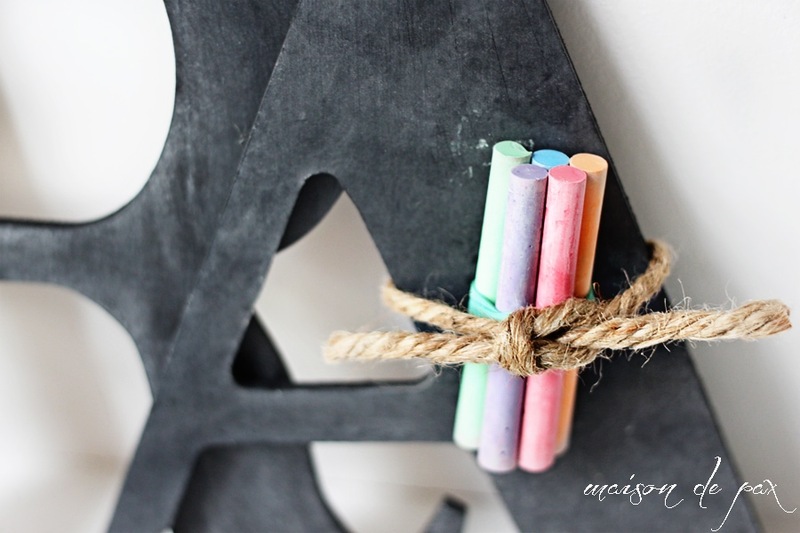 To make them “party favors,” I simply bundled five pieces of colored chalk in a little rubber band and tied the bundle to the letter using more jute twine. The rubber band peeked out slightly, but I didn’t mind. And, naturally, neither did the kids! They were so excited to have their own letters and be able to color on them… Most of them began coloring even before they left the party! For less than $2 each, I’d say they were a huge success. 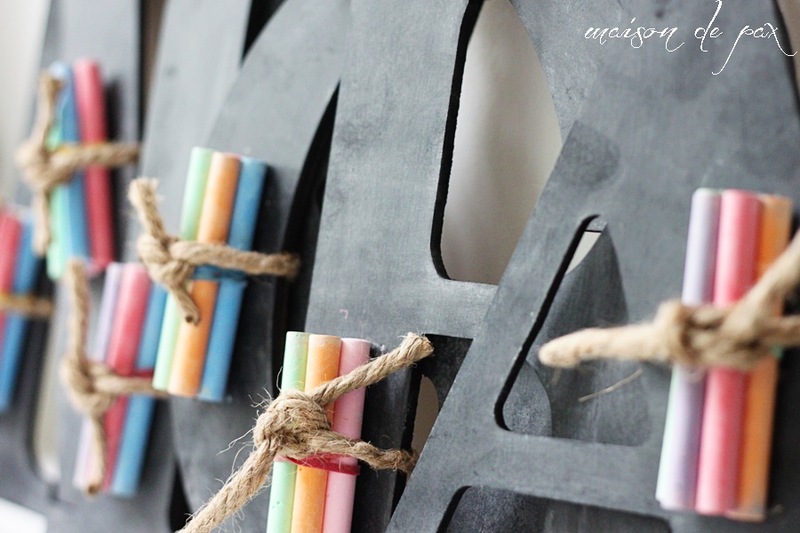 Be sure to come back next week for more chalkboard ideas for birthday parties! Love the idea… great job. What a cute project! 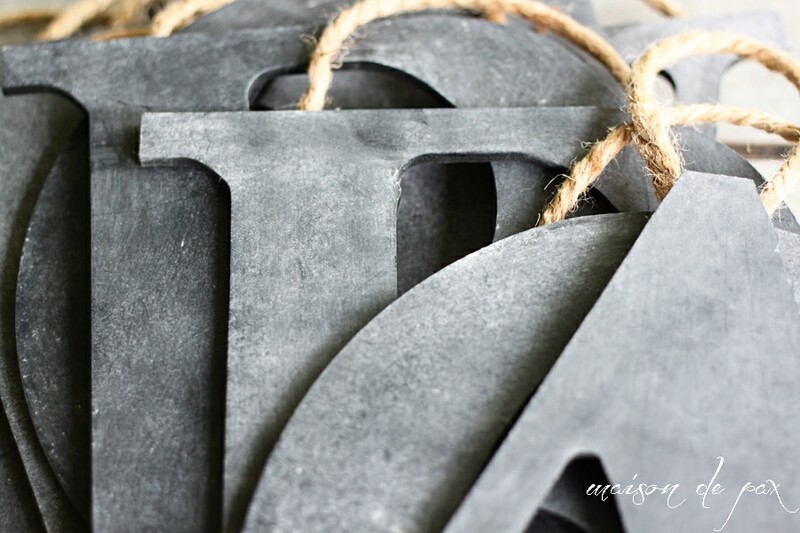 Combiness two of my faves…monograms and chalkboard <3. Thanks, Andrea. You really can’t go wrong with those two, can you? 🙂 So glad you like it! What a cute idea and I love the chalk tied to them. Thanks tons for linking to Inspire Me. Super cute & I love how portable it is! Perfect for little ones! Such a great idea for little hands! Love! Anything to constructively occupy those little hands, right? 😉 So glad you like them, Ty! Oh my gosh Rachel, you are a GENIUS! I have a double birthday party coming up (my two middle children are one year and four days apart in age, May 13 and 17) and I’ve been wracking my brain trying to figure out a good, fun, easy and inexpensive favor for the kids coming, and this is it, right here! I’d love to have you link this up with me and the Create & Share DIY and Recipe Party. I hope to see you there! Oh my gosh Rachel, you are a GENIUS! I have a double birthday party coming up (my two middle children are one year and four days apart in age, May 13 and 17) and I’ve been wracking my brain trying to figure out a good, fun, easy and inexpensive favor for the kids coming, and this is it, right here! I’d love to have you link up with my crafty party, this would make an excellent addition! These are absolutely adorable!! What a creative and easy party favor! I will definitely hold on to this one for my daughter’s fall birthday party! Thank you for sharing! Thank you for your sweet comment, Melissa! I’m so glad that you like them, and I hope they’re just as wonderful for you this fall! Haha. Thanks, Jamie! I’m just relieved when they don’t totally flop. 😉 Glad you like them! Oh my goodness these are too cute – what a great giveaway idea!! Pinning for sure!! We need ideas like this when we have little ones, don’t we? 😉 So glad you like them! This is such a cute idea! 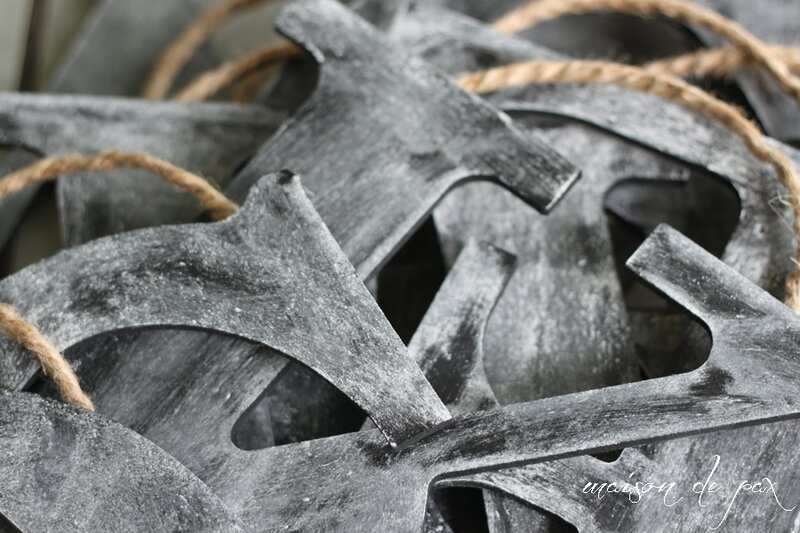 I really like the twine wrapped chalk pieces. I’m so glad you like them, Kathy! Thank you for your sweet comment! Amazing idea and they turned out beautifully!! Pinning so I can be sure to come back to these…thank you so much for sharing such a fun project!! Oh my goodness…this will be my family CHRISTmas presents! Thanks for sharing! Kajun Hugs! What a cool and unique idea!!! So glad you like them, Mari! I am the same way, I feel so not crafty!! This is so cute, and I wish I had thought of this when my kids were little. Thank you so much for sharing at Redouxinteriors! Thanks so much, Karen! I’m so glad you like them, and I appreciate your hosting your fabulous party each week! And with that…My end of the year teacher’s gifts are decided. 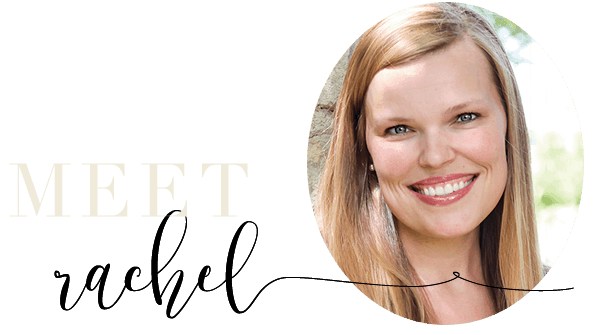 This is such a cute and fun idea, Rachel! Love, love it! Super cute idea! I’m going to try for my son’s birthday. Do you know which size of letter did you use? I’m so glad you like them, Maira! I keep trying to remember to actually measure them for you, but my brain is mush these days… Sorry! My best guess is 10-12″ tall, though. I hope that helps! Wonderful gift, I have 10 grandchildren and these will make wonderful gifts for 7 of them. I bet my 22 year married granddaughter will want one. Not sure what I did wrong. Followed your directions to a tee. The colored chalk I bought at Hobby Lobby does not write on the letters at all. It scratches the letter. It is dustless chalk. My regular white chalk works fine. Any suggestions here. I’m so sorry to hear that, Cherilyn! Unfortunately, I don’t have any of the dustless chalk to try… I don’t think I’ve ever used any of that on my homemade chalkboards. Maybe that’s the difference? I also found some cheap, regular colored chalk at Walmart; you might try there? So sorry again that it’s giving you trouble! Good luck! Went to the ABC School box and bought regular chalk, (NOT DUSTLESS) and they worked great. And the price on their chalk was way less than Michaels. My Wal-mart did not carry regular chalk, just sidewalk. I am right there with you on the ability to be creative yet not real craft-y…but these are precious!!! I love this idea and will probably steal it in the near future. So smart!!! I’m so glad to know I’m not alone, Kelly! 😉 And so glad you like the chalkboards. Hope you have fun making them! 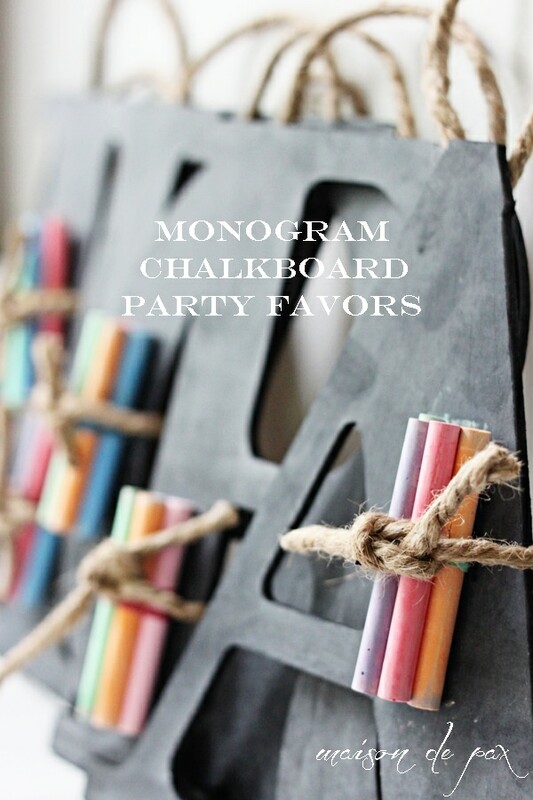 I LOVE this idea, I’m such a sucker for a chalkboard!! Cute presentation too! Thanks, Andrea! So glad you like it!! What size letters did you use? I was thinking about making these for my daughter’s preschool classmates for Christmas. I think they’re about 10″ tall, Kisha… and maybe 8″ wide. Hope this helps! Rachel, thanks for the amazing idea. I just made this project for my girl’s 2nd bday party, next saturday, and I’m really excited about giving the kids something useful, other than a bunch of candy…. (I’m giving them candy too lol). Not difficult at all. I can’t wait to see how the kids enjoy it. My spray painting skills are super bad so I ended up spotting the back wit black paint, thankfully had some pink paint left over from another project.. they look sooooo beautiful. Thanks for sharing! I’m so glad to hear it, Ana! If the kids love them half as much as mine do, then you’re set. 😉 I hope it’s wonderful, and happy birthday to your little girl! Love it!! 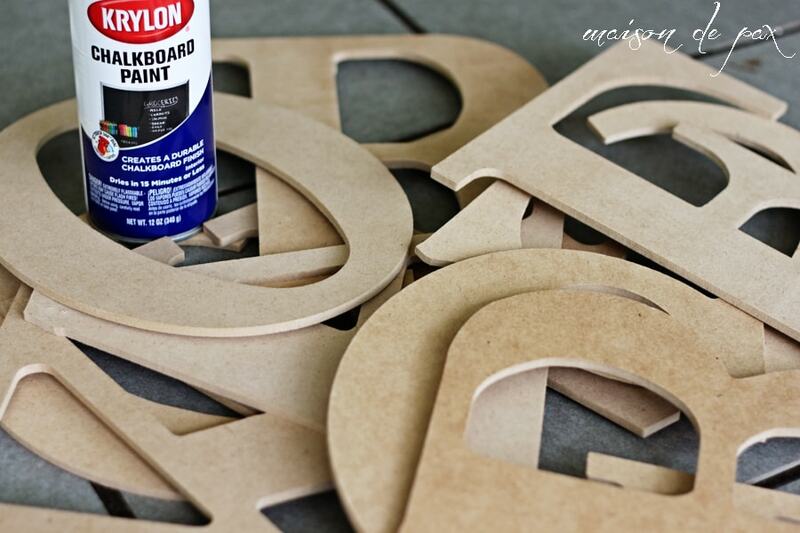 How many letters can you do with a can of chalk paint? I’m sorry, Erika, I don’t know! But I did at least 12, and I don’t remember having any trouble with one can. So glad you like it! What a great idea!! I am going to be making these for my daughters birthday. 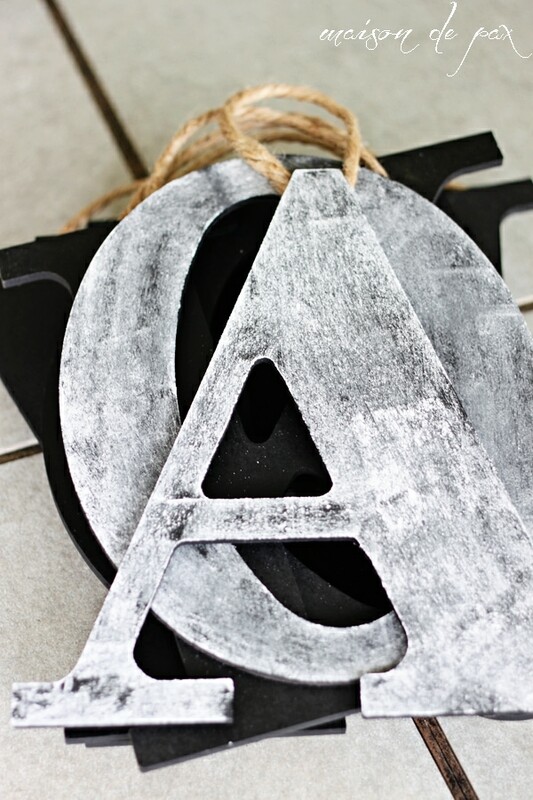 One question for you would be, did you spray paint the back of the letters (I don’t think so based on a picture in your tutorial. But want to confirm). I’m so glad you like them, Shadi! I did not bother to paint the back… Saves a little time and effort. 🙂 Hope this helps! I know a few “big” kids who would have fun with this project! Thanks for posting. Clever idea! Fun idea. I am hoping to create this for my daughters 5th birthday. Would you please tell me what size were these letters? Thanks Much. I’m so glad you like it! I believe they were about 10″ high. I hope this helps! 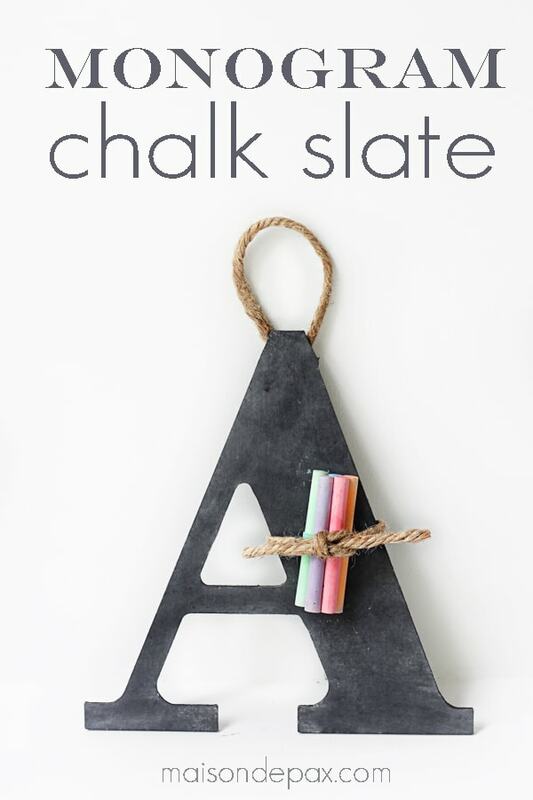 This is such a cute idea I love it and I’ve tried it but for some reason I can’t get that chalk to write on the chalkboard spray paint …did I do something wrong? Please help!